There is a certain beauty in decay, a strange compulsion to breath in what may soon be lost. A need to be part of an evolutionary journey that like tomorrow will inevitably arrive. Forget the gleaming luster of the sports bar that comes with all the design practicality and functional warmth of a corporate fridge. The high end, dust free, sanitized and chain managed ‘lounge’ with its wall to wall TV’s and its robotic, plastic faced staff who call you ‘Sir’ with a coached sincerity and supercilious smile that marks them as a recent graduate of the Uriah Heep college of “umbleness”. Give me silent, nodded acknowledgement of my presence from a melancholy bartender, a sticky surface to place my beer on and some dank, matured gloom to get lost in every time. Welcome to the Mars Bar, standing on the corner of 2nd Avenue and 1st Street in New York’s East Village. I say ‘welcome’ there is not much that proclaims a welcome here. 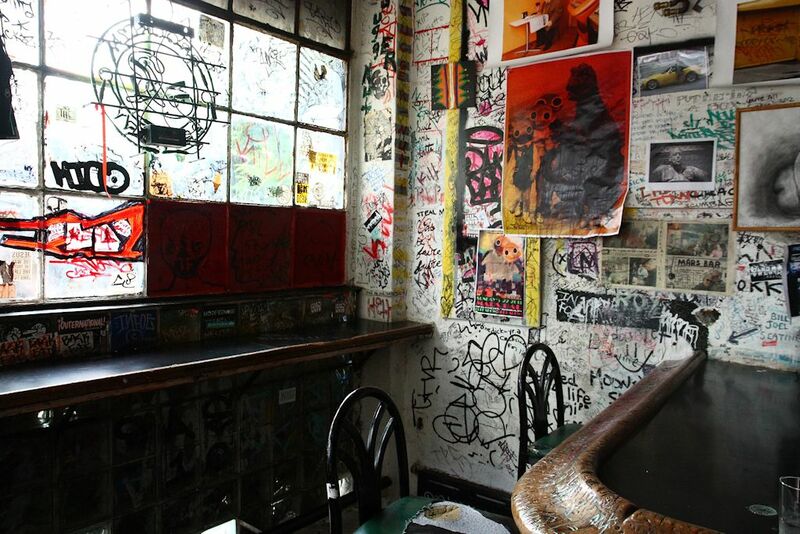 It is a falling down, graffiti scrawled temple to chaos, dust and booze that offers no apology about itself or its clientele. I love it, love it, love it! Its unwillingness to change over the years while all around it the buildings glisten from the shrapnel of a recent modernization bomb warms me to the core. The Mars Bar has stamped its muddy feet like a spoilt child defying its parents by refusing to get dressed for Church or even run a comb through its tatty hair. In England it would have had a preservation order slapped on it, given a listed building status and allowed to rot in uncomfortable splendor. Not in New York, sadly. The Mars Bar will close its rotting, filth splattered door for the last time at some point towards the end of the summer and the bulldozers will remove every trace of the brightest planet in a very dark sky. Manhattan should hold its head in shame. Excellent description (images and words) of a unique place! Your writing is an essential element of your photo journalism. The two together turn the ridiculous into the sublime….. well, you know what I mean! Hey John, thank you (I think) ……. the Mars Bar was a classic. Sadly it has been bulldozed now. Very soon, smart upwardly mobile New Yorkers will be flicking olives into their martini’s and hugging their investment portfolios on this very site. Tempus Fugit to them! Thank you, John Smith….for so eloquently expressing my thoughts…. It’s so sad that it closed! I love decaying buildings, boats, ballrooms. Have a look at this: http://www.marchandmeffre.com/detroit/index.html Thanks for liking some of my photos. I’ve put some up of a sunset taken above the clouds, 10,000ft up in Hawaii. Sad it is. I have seen pictures of Detroit, a great shame for such a proud city. Wow what an experience Hawaii must have been, great photographs. Thanks for the comment. I was here once. 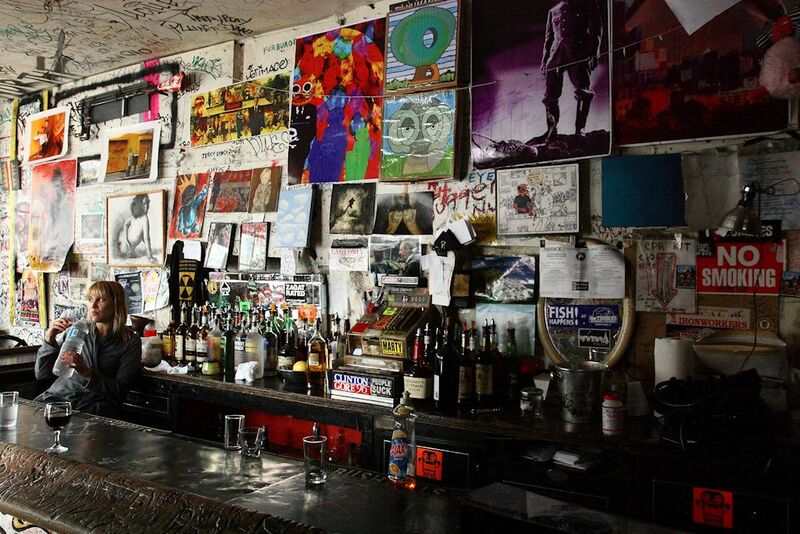 I miss all the now defunct NYC dives and nightclubs. 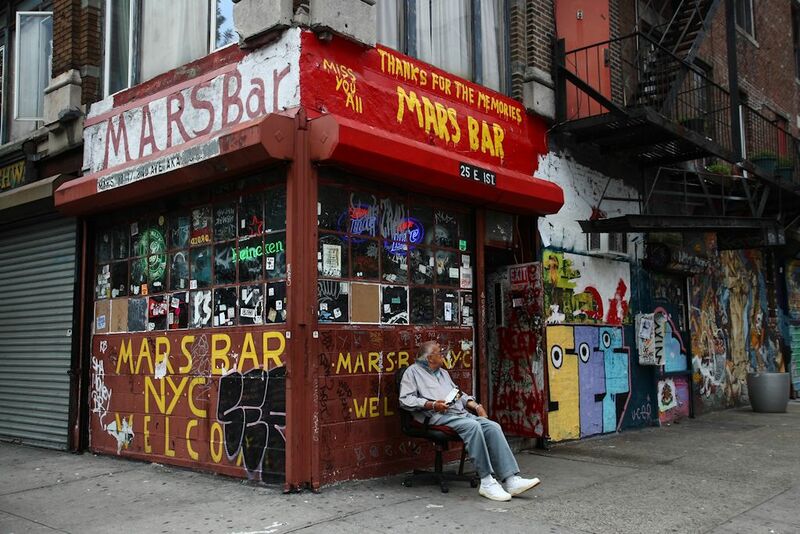 The Mars Bar was a magnificent example of a dying breed of the NY ‘Dive Bar’. There are very few are left, sadly. Hogs and Heifers on Washington Street is the only other true ‘Dive’ (that I know of) still in Manhattan and the days of H&H are numbered I fear. Thanks for the comment.